Why are so many websites forcing me to take a survey in order to read the news these days? This question was answered on May 16, 2015. Much of the information contained herein may have changed since posting. The Internet has spoiled us into believing that everything we want to access should be free, but content providers must find a way to monetize their information or go out of business. The old newspaper model of charging readers a subscription (a.k.a. ‘paywalls’) has not translated to the Internet, unless you’re a large news organization such as the New York Times or The Wall Street Journal. Since so few websites can survive using a paywall and display advertising can’t pay the bills, a new tool called a ‘surveywall’ is being used to help fill the revenue gaps. Instead of charging you directly for access to the information you seek, you get to pay the site with a small amount of feedback via the survey. 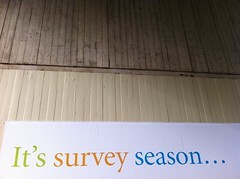 I have to admit, when I first started seeing surveywalls, I too was aggravated because I just wanted to get to the information. That all changed when I attended an enlightening presentation led by Monica Plaza, Head of Business Development for Google Consumer Surveys (GCS). GCS is the brainchild of a couple of engineers at Google, one of which is married to a journalist. They knew that quality content costs money and if news organizations can’t find a way to generate revenue for content, journalists will obviously be impacted. What I didn’t realize was that an app that I’ve been enthusiastically using and recommending to Android users for years called Google Opinion Rewards is the same system. I’m more than happy to take short surveys in exchange for credits in the Google Play Store, so I shouldn’t be any less enthusiastic about supporting a website that has information that I value. GCS started out on a small number of major news sites, but has been expanded to over 1000, so you’re likely to start seeing them more often. If you’re a small business and want to do any form of market research, you really should take some time to learn about this pretty impressive tool. GCS can get your market research questions in front of more than 10 million respondents per week and generate responses in a very short period of time. I decided to give it a test drive for a project myself and created a two-question survey just to see how the system worked (I also found this online coupon). You can ask up to 10 questions per survey and you only pay for completed surveys that start at 10 cents for each one question survey and range from $1.10 to $3.50 for 2-10 question surveys. If you’ve ever paid for a focus group or market research in the traditional manner, you know that the sample size is usually very small, it takes a long time for the research data to be compiled and it can get very expensive. Within an hour of submitting my 2 question survey, I had 37 completed responses with a plethora of detail and I should have the 500 I asked for within 48 hours. Whether you’re a web surfer or business owner, hopefully your perspective on surveywalls will be more well rounded now!